I came across an article about hemp flour a little while back and it made me quite curious to try it. I bought a bag and turned to The Google School of Culinary Arts for information on how to work with this gluten free high protein flour. Then, as I usually do, I decided I’d experiment. Not knowing how I’d like the flavour, and not wanting to be wasteful with ingredients, I figured I couldn’t go wrong with chocolate, it has the power to make anything taste good. Since hemp flour doesn’t rise like regular flour does, brownies seemed like a good idea. My first attempt resulted in tasty but slightly dense/dry/flat brownies. I also found the hemp flavour to be a bit overpowering and slightly bitter. Hubby gobbled them up anyways because well, chocolate. I benched the recipe until recently, and after tweaking it I got a super moist and fudgy brownie. Just what I was looking for. They’re rich and chocolaty from the pure cacao powder, creamy and nutty from the natural hazelnut butter, and sweetened with pure Canadian maple syrup. The hemp flavour is not at all noticeable and while you could probably substitute, I haven’t tried this recipe with any other flour. In case you’re wondering, hemp and marijuana, while members of the same family, are actually two different plants with substantially different levels of THC, marijuana containing 20% and hemp less than 1%, making it relatively THC free. The right balance of omega 6 to omega 3 is extremely important to the healthy functioning of our bodies. A diet that is too high in omega 6 (and low in omega 3) has been linked to diabetes, heart disease and chronic inflammation. Obviously, eating hemp seeds alone is not going to fix an existing imbalance you may have, but they are a great addition to the diet, as you make other adjustments. Hemp flour is made by milling hemp cake. The hemp seeds are pressed to extract almost all of the oil and the resulting cake that remains is then milled to get hemp flour which is naturally gluten free, high in protein and fiber. 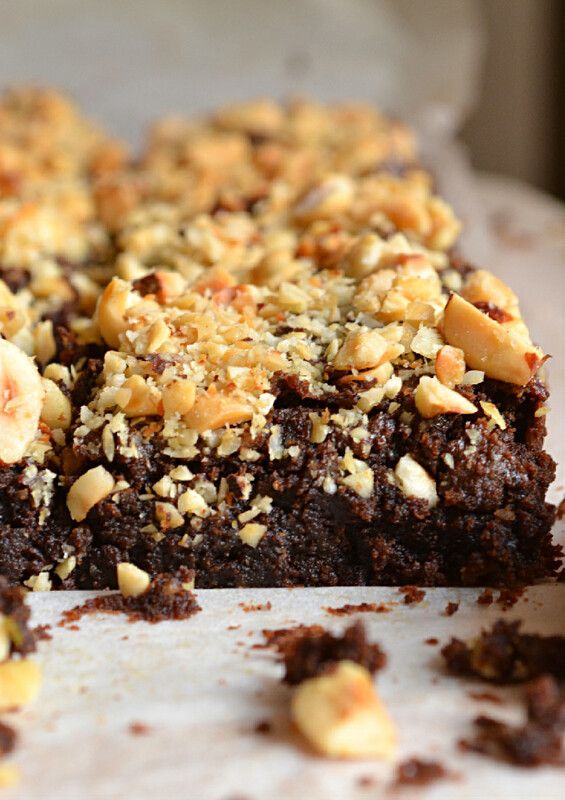 While it won’t contain the same essential fatty acids as whole hemp seeds/hearts, it’s a way healthier alternative to highly processed flour and makes a great brownie. Mix all dry ingredients, except chopped hazelnuts, in a large bowl, then create a well in the center and add in all wet ingredients. Stir mixture together with a spatula to combine thoroughly into a smooth and homogeneous batter. 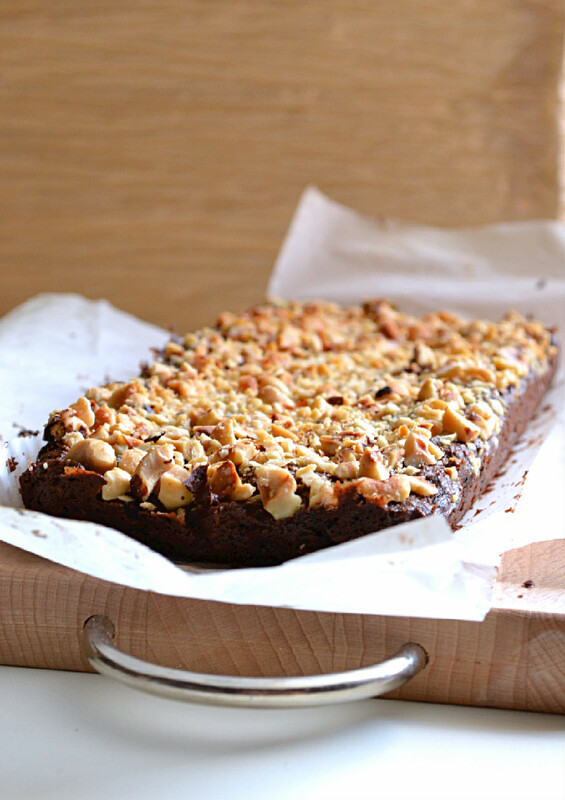 Pour batter into prepared loaf pan, smooth out the top and sprinkle with chopped hazelnuts. Remove from oven, let cool for 15 minutes to allow the brownies to firm up. They will seem soft and undercooked at first. Once slightly cooled, lift the parchment paper and transfer onto a cutting board. If you want clean slices, let it cool further, for at least 20 minutes or longer before slicing it. 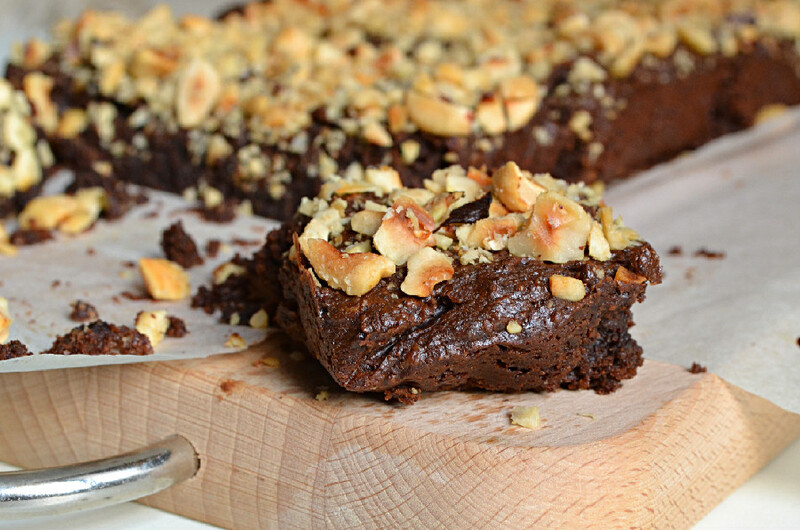 If you’re like me and you can’t wait, slice immediately and enjoy messy brownies. Store in an airtight container for up to 3 days in a dry and cool place. 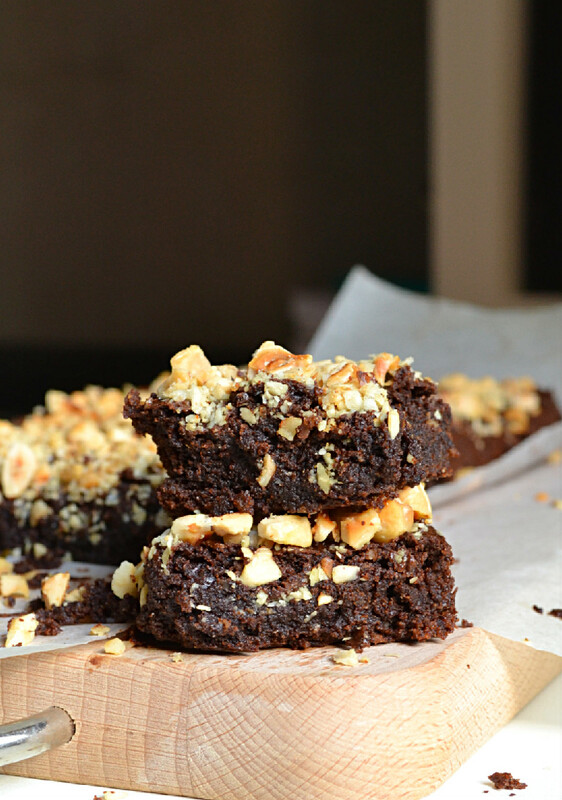 These look awesome ❤ I have a hazelnut brownie recipe I’m saving for my book, but these look just amazing and I love the hemp seeds in there. Hemp seeds + chocolate are such a great combo!